From mouth-watering Vinho Verde and Verdelho to rich Touriga Nacional and robust Bairrada, Portugal’s spectrum of fabulous and food-friendly wines offer diverse pairings at the dinner table. Family-run, boutique wineries, with a long history of crafting wine, produce wines that are meant to go with food. The Portuguese don’t usually drink a glass of wine by itself, their tradition is food and wine together. 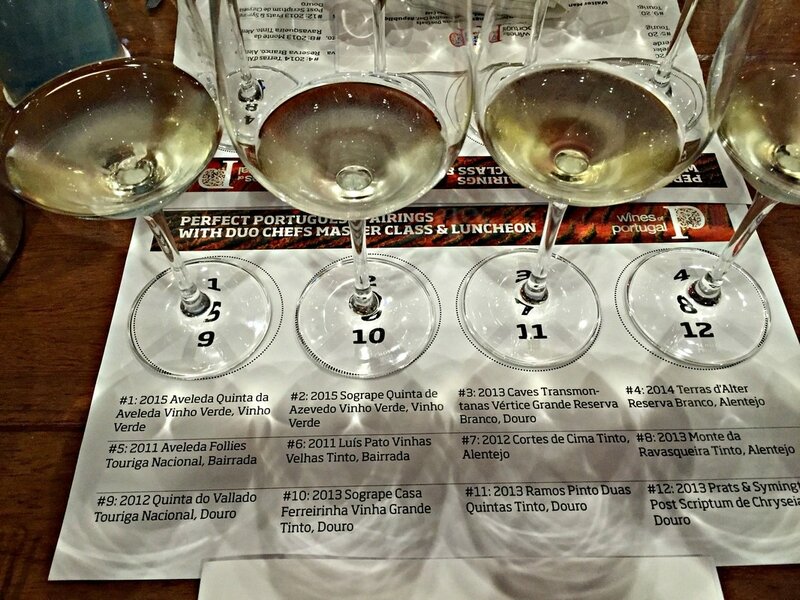 Last summer, Wines of Portugal demonstrated this with a fascinating luncheon where the sum of the parts was certainly greater than the individual players. Wines of Portugal is getting the word out, that Portuguese wines are dynamic and exciting, and a bargain for the quality. Eugénio Jardim, the US Ambassador for the marketing organization, hosted a trade luncheon at République Restaurant in Los Angeles, displaying the versatility and quality of Portuguese wines. Billed as “Perfect Portuguese Pairings with Duo Chefs”, Walter Manzke and Eric Bost of République crafted a modern menu, reflective of California’s fresh focus, and Telmo Faria of San Francisco’s Uma Casa designed a more traditional Portuguese pairing. It was a dazzling array of exquisitely prepared dishes, with both approaches pulling something different from four wines paired with each course. Master Sommelier Evan Goldstein discussed the wines, and recommended which ones paired best with each dish. Here’s a brief discussion of what worked best. First course, Manzke and Bost prepared a Hamachi Crudo with a deconstructed Gazpacho drizzled with Mustard Seed Oil. 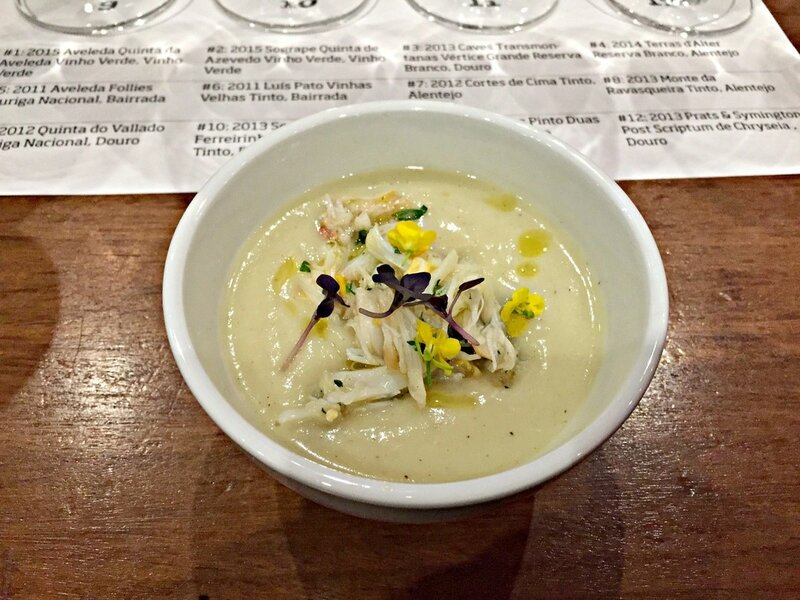 Faria offered a “Sopa de Funcho”, a Chilled Fennel Soup with Dungeness Crab and Corn Salad. Goldstein recommended the 2015 Aveleda Quinta da Aveleda Vinho Verde, a crisp, floral and fruity white, and the 2014 Terras d’Alter Reserva Branco from Alentejo, a blend of five grapes that expresses a stone fruit and mineral character, for the soup. With the Hamachi, Goldstein paired the 2013 Caves Transmontanas Vértice Grande Reserva Branco from Douro, a fabulous 50/50 white blend of Gouveio and Viosinho that was ripe with tropical fruit and a leesy essence, and the same Reserva Branco white blend mentioned earlier. Second course, Manzke and Bost presented an earthy Spinach Cavatelli with Forest Mushrooms while Faria conjured “Arroz de Pato” Morel Mushroom and Duck Confit Risotto with Seared Duck Breast drizzled with Red Wine Cherry Sauce. Goldstein’s pick for the duck was the 2011 Aveleda Follies Touriga Nacional from Bairrada, a savory, polished wine of blackberry and plum fruit, a fabulous pair! For the cavatelli, he chose the 2012 Cortes de Cima Tinto from Alentejo, a floral, savory red with ripe tannins and a long finish. The savory nature of both wines really brought the mushrooms to the foreground, emphasizing the earthiness of both dishes. Third course, Manzke and Bost concocted a Beef Tenderloin with Sweet Onion, Oven-Dried Tomato, and Bacon accompaniments while Faria whipped up “Carne à Jardiniere”, a Braised Short Rib with New Potatoes, Baby Carrots, Summer Beans, bathed in a Braising Jus. Goldstein selected two wines for the beef, the 2012 Quinta do Vallado Touriga Nacional from Douro, a beautiful full-bodied wine of black cherry fruit, and the 2013 Prats & Symington Post Scriptum de Chryseia from Douro, an elegant and dense wine, with black cherry fruit and polished tannins. Both of these wines also went well with the short rib, while the 2013 Sogrape Casa Ferreirinha Vinha Grande Tinto from Douro, a rich and round red wine, also deserves a shout-out. Want to know more about Portuguese wines? Portugal is a land of contrasts, with vines clinging to an array of soils and hundreds of diverse micro-climates, with 250 indigenous wine grape varietals. From the cool, refreshing whites of the northern Vinho Verde, known for its Alvarinho, to the hot, parched southern Alentejo, with its Alicante Bouschet, in between the two are some of the more recognizable wine regions, the Dão and Douro, known for Touriga Nacional, considered Portugal’s national grape. Even though the red wines of Portugal are powerful, rich and concentrated, they are not alcoholic, coming in at a balanced 13.5% ABV, and with great natural acidity, it makes them extremely food-friendly. There are three classifications of wine. Vinho is the lowest level, commonly considered table wine. Vinho Regional is the next step up, and consists of wines of character, typical of the region, with many experimental blends that don’t meet the stringent requirements for the highest classification, DOC. DOC wines are highly regulated, and have to go through a rigorous approval process to prove they’re worthy. And since joining the EU in 1986, Portugal has advanced their wine industry exponentially. The wines are becoming more sophisticated, with advances in technology and an emphasis on quality. Portugal has never been a varietal-driven wine culture, they excel at blending, as evidenced by their most famous wine, Port. Rediscovered by wine drinkers in recent years, what once was old school is now considered the “new” hot region, with excellent wines at great prices. 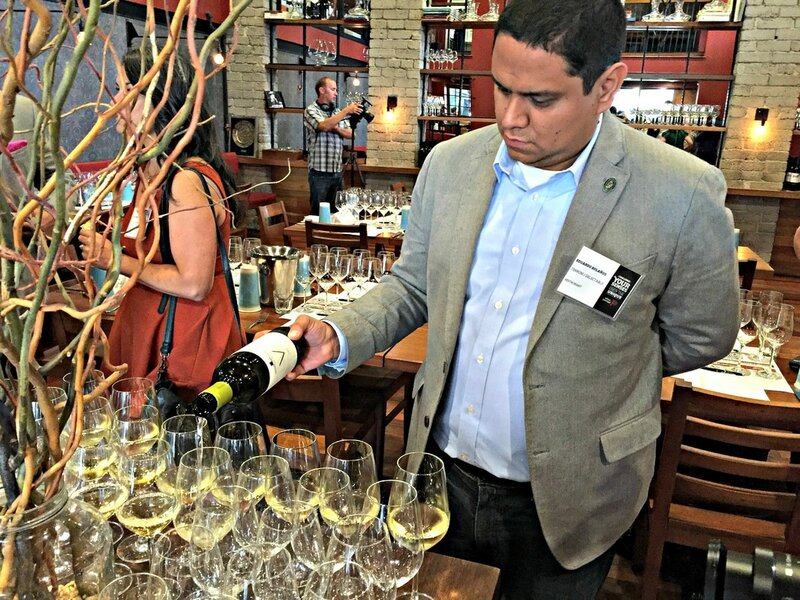 ​Wines of Portugal showcased many wines last year, traveling to many US cities for wine events and dinners, educating consumers of all that Portugal has to offer. Exceptional dry wines, red and white blends, offer quality and value. Portuguese wines spring from tradition, yet embrace modern influences. It’s an exciting time to drink wines from Portugal!